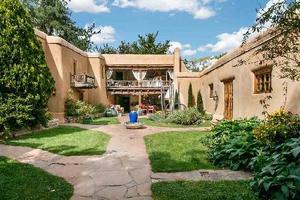 One of the most significant homes in Santa Fe. Completely renovated in 2016, the original Frank Applegate home is a timeless treasure with two bedrooms on the lower level & two bedrooms upstairs. Built in 1921 by Applegate for use as his private residence, evidence of his aesthetic and inspired vision are found throughout this expressive home. 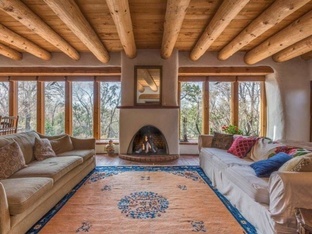 Blending both the Spanish Colonial and the Pueblo vernaculars, Applegate created what has been chronicled to be one of the original homes of the Pueblo Revival movement otherwise known as Santa Fe Style. Built two stories high with adobe brick, this iconic residence is rich with detail and design. Applegate, whose friends were Fremont Ellis, Ansel Adams, Will Schuster, and Walter Mruk were romantic rebels inspired by the beauty of the land and the modernist ideas of their time. He was an architect and artist and continued to build and remodel several more homes in the area which further established him as a major influence in the Pueblo Revival movement. In 1978, William Lumpkin, legendary builder and authority on historic preservation, was retained to create a spacious sunroom expanding the home to its current, approximate size of 3,576 square feet. The ample grounds provide a lush and private, park-like setting for entertaining or simply enjoying nature. Few homes are as historically & architecturally significant and steeped with such provenance as this fabled home.